The affluent seaside resort of Deauville is located along one side of the River Torques, 15 km southwest of Honfleur. The surrounding area of coastline is often thought of as the Northern Riviera, with its many rich and famous inhabitants. The town even has its own American Film Festival held each year. Deauville has a population of around 4300, although this number swells considerably during the tourist season. 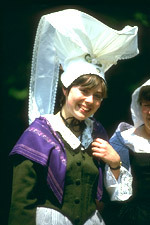 The town is nicknamed the 'Lady of the French coast'. The most prominent lady to arrive here was Coco Chanel, who opened up her highly acclaimed boutique here and consequently elevated the status of the town, turning it into the fashionable resort we see today. A large number of designer outlets have followed resulting in an immensely desirable shopping scene. There are a number of events held in Deauville each year, such as Regattas, polo tournaments and race meetings. The town has a number of casinos, which make up a substantial part of the local economy. The largest one is the Casino de Deauville. You'll need to be in formal dress, which can be rented from the reception. Trouville also has a casino, although it is more relaxed and has its own beachfront bar. The 500 metre long Promenade des Planches runs alongside the beach that the local celebrities like to be seen on. 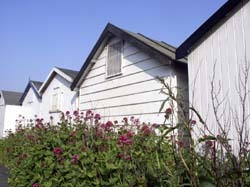 There are a number of beach huts that are available to rent. Heading towards Trouville, you'll come across 'La Plage', which tends to be less crowded. Next to it is the Aquarium Vivarium de Trouville, with a wide range of aquatic species. There are also exhibits of reptiles (including crocodiles) and very intriguing insects that you won't find in your back garden. Being so close to the UK, there are a number of options when it comes to travelling to Deauville. There are flights to Deauville Saint-Gatien airport itself, but these are subject to change. You can take a ferry to either Le Havre or Ouistreham (Caen) or a train, via the Channel Tunnel and the TGV, to Le Havre or Caen. Unsurprisingly, property prices in the town are very high. The most expensive are to be found between the race track and the coast. Parisian second home owners dominate the market and there are very few British buyers in the area. Do you know Deauville better than we do? Do you have photos of Deauville? Located on the east of the coastline of the Calvados department in Normandy. Access: Deauville has its own airport, but you can just as easily get there by train or ferry. Economy: Since its creation, gambling has always been the largest industry. Interesting fact: The town evolved around Napoleon III's decision to build a race track here.